Tavern Kafanica Trg is located in downtown, between club Noir and Donut Bar. Location of tavern Kafanica Trg is excellent. Tavern is located in main city square, from where is a route for a large number of buses, so if you are without car or just want to have a drink more, bus station is in front of tavern. Tavern Kafanica Trg consists of two levels. As you enter you have an impression that you have entered a saloon in the Wild West, because of the chandeliers, bar and tables, but with plaid sheets. On one side you have a spacious bar and on the other side is stage and between are wooden tables and benches and of course bar tables. Music is always wired, so even though tavern Kafanica Trg is one of the biggest taverns in Belgrade that accommodates 400 people, you will always be in center of attention. In tavern Kafanica Trg prices are very affordable, someone would say ''student prices'', therefore tavern is very popular among younger population. While at the same time it's favorite place of slightly older people. Tavern Kafanica Trg is opened four days a week, on Wednesdays, Thursdays, Fridays and Saturdays, where every day you can listen to wired traditional music. For a longer period tavern Kafanica Trg is a place of gathering for younger and older people, so it's not unusual to organize celebrations, graduation parties, bachelorette parties and many others. Calculations say that only past year over 30000 people have enjoyed in tavern Kafanica Trg. Meaning of ''enjoyment'' in this case refers to great song, dance, and of course, friendship of beautiful girls. Many of them fall in love right in this tavern. 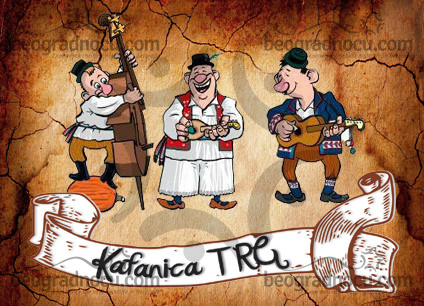 Any way, tavern Kafanica Trg is an excellent choice for all people who love atmosphere in taverns. Come and see for yourself.